Horror games are a bit like comedy games in that you rarely see one done right. Horror games are difficult because they have to create and then build that level of tension that either ends in relief or moments of sheer terror. Do it right and you have a masterpiece, but it's all too easy to fall into schlock and cheap scares. Doom 3 was a semi-scary game but quickly turned south as it became one set of jump scares after another. Sure it's scary and you get that jump, but when you use the same technique over and over again, it gets old quickly. The Evil Within is a game I've kept on my radar, as the reaction from gamers and journalists in the industry after playing the game was a resounding NOPE. Not a NOPE as in, "I don't want to play the game," but a NOPE because of how terrifying it is. The game was also on my radar because my fiancée got me hooked on horror movies during our courtship. I was interested to see what her opinion would be, as she's a bit of a connoisseur of scary media. The game was not on my radar because of its lineage to the Resident Evil series. I've never played any of the Resident Evils, so I was largely unfamiliar with Shinji Mikami's work. Unfortunately for Bethesda, the bar on horror games was raised significantly when Sony released the P.T. demo for Silent Hill at the Tokyo Game Show earlier this year. This short, small demo was one of the most terrifying games I've ever played—and the first time I have ever actually screamed while playing a game. The Evil Within starts with Detective Sebastian Castellanos and his partners, Juli Kidman and Joseph Oda, being rushed to a local medical hospital because something terrible has happened. When the detectives get there, they find that all hell has broken loose. As they investigate, Sebastian is knocked unconscious by the hospital's deranged leader, Ruvik. He later wakes up within a cell, and for the next 15 to 20 hours, you'll guide him as he tries to figure out what is going on, while saving himself and his partners. The plot throws a lot at you to start with, and there's a real sense of disorientation for the first half as you teleport here and there without a lot of rhyme or reason. This is a bit frustrating, but once you get about eight hours into the game, things start to make sense as the puzzle starts to come together. That's a lot of time to put in, but the payoff is worth it as that is when the game really hits its stride. The Evil Within has a few things going for it. The first is that the monster design is top notch, and almost every creature seems to be straight out of the nightmares of a madman. The Haunted are the foot soldiers of evil and come in all shapes and sizes, wielding a variety of weapons. Zombie-like in appearance and manner, they rarely go down easily, and come in a range of skins—from masked fiends to some that look like they fell into a pile of railroad spikes. The Haunted pale in comparison to the boss monsters. Sure, we've seen a guy in tattered clothes with a chainsaw, and various dudes with boxes and other shapes on their heads, but there's a female creature with long black hair and more limbs than I can count (it's hard to count when you're running away) that elicits some genuine terror. It helps that she typically erupts from the bodies of corpses lying around. Of course, pretty creatures are nothing without a gorgeous game world, and the game world itself is gorgeous. It is presented with the odd screen ratio of 2.35:1, which means you have large black bars at the top and bottom of the screen, which I never really got used to. I'm guessing this was partly stylistic and partially due to technical reasons, but no matter the reason, it does give the game a distinctive look. Of course you'll need weapons to fight those monsters, and it's here that The Evil Within makes some interesting choices. At the core, you have the old shooter favorites of pistol, shotgun, and sniper rifle, but what separates The Evil Within is the addition of the "Crossbow of Agony." The crossbow can be equipped with a few different types of bolts that are either found around the level or constructed from parts (parts are either found on their own or salvaged by disarming traps). You have the traditional giant iron bolt that can pierce multiple enemies, an explosive bolt, a freeze bolt, an electrical bolt, and my personal favorite, the flame bolt. The flame bolt is great because when you hit something with it the bolt spews fire everywhere and can ignite multiple bad guys at once. Knowing when and how to use these bolts is critical, as ammo is scarce even when playing on the casual difficulty level. There are times when you are confronted with large quantities of The Haunted and you have to either take them out one by one via stealth or take them out en masse by using the bolts correctly or leveraging the environment. Weapons and abilities can be leveled up by collecting green gel that is scattered around the levels, and given as a reward for killing various enemies. With the gel you can level up your health, the amount of ammo you can carry, the damage your weapons deal, and a few other key things. This does add a bit of spice as multiple playthroughs would be required to unlock everything. While you mostly explore the usual collection of haunted mansions, spooky mental hospitals, and trap-laden dungeons, there are actually some outdoor levels to break things up a bit. 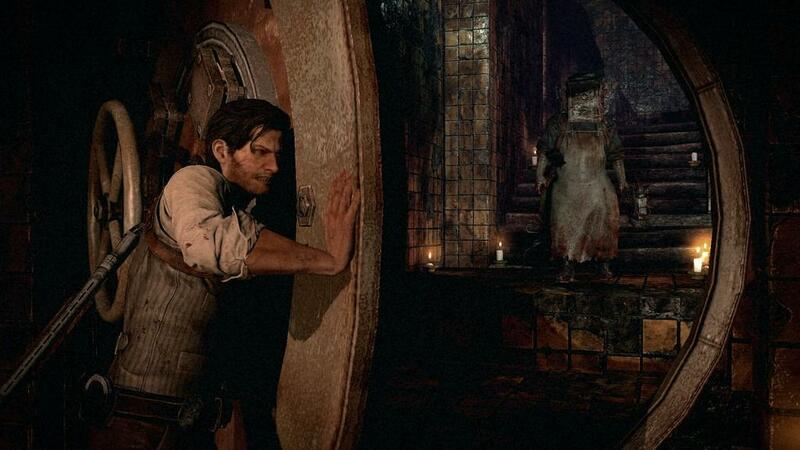 The art design is top notch and The Evil Within mostly looks and feels like a next-generation title. The environment isn't all high quality polygons and high-resolution textures, though, as every level is chock full of well-hidden traps. These can range from bear traps to trip wires rigged up to explosives. There are even proximity sensors which can be used against the various inhabitants of the game. There are some interesting technical issues that I encountered. The first being lots of texture pop-in and some odd clipping issues scattered throughout the game. If the engine wasn't so brilliant in other areas it might have been easy to not notice them, but there were moments where Sebastian was walking through a beautifully rendered waterway, and then would clip through some debris on the surface. There are plenty of other examples, but this this one stuck in my craw the most. The third-person perspective also made it difficult to interact with the environment at times. I sometimes had to repeatedly approach some object in the environment in order to get the object to highlight so I could pick it up. This was aggravated when trying to pick things up while being chased by a large man with a giant hammer. The game also has some interesting user-experience quirks, the biggest being that if you map the healing syringes to d-pad, it will automatically reset the selection if you run out and pick more up later. This is something I found out the hard way, as I kept trying to figure out why I wasn't healing despite having plenty of syringes in my inventory. The Evil Within is also a bit unforgiving in some areas and leads to a few one-hit kills, which can cause a bit of rework. Thankfully checkpoints are usually located right before these, but there were still a lot of moments where I got frustrated because a glitch got me killed needlessly. I came away from The Evil Within mostly impressed. When the game works, it puts a pit in your stomach until you navigate Sebastian to safety. But there are too many times when the game gets in the way. As for my fiancée, she found the game surprising but not horror-movie scary. There were a few minutes early on where she watched from behind a pillow, but after that it was more about the tension than the scares. She found parts of the game creepy (like the movie Saw) but the experience for her was not nearly as terrifying as the P.T. demo. It might not be the scariest game out there, but The Evil Within brings the scary and the tension. Unfortunately it trips over its feet in key places. Hi, my name is Charles Husemann and I've been gaming for longer than I care to admit. For me it's always been about competing and a burning off stress. It started off simply enough with Choplifter and Lode Runner on the Apple //e, then it was the curse of Tank and Yars Revenge on the 2600. The addiction subsided somewhat until I went to college where dramatic decreases in my GPA could be traced to the release of X:Com and Doom. I was a Microsoft Xbox MVP from 2009 to 2014. I currently own stock in Microsoft, AMD, and nVidia.